The Coalition for Energy Efficient Comminution (CEEC) has announced a new team will steer its comminution energy curves into the next phase of development, following the move by project lead Dr Grant Ballantyne from research to industry. Developed by Dr Ballantyne and Professor Malcolm Powell at The University of Queensland’s Julius Kruttschnitt Mineral Research Centre (JKMRC), in collaboration with industry, the energy curves enable mines to benchmark the energy efficiency of their comminution circuits, according to CEEC. This helps communicate the significant value that can be harnessed by improvements in comminution efficiency across mine sites. The new team, led by JKMRC Senior Research Fellow Dr Cathy Evans, has expertise across the mining value chain, with strengths in comminution and mineral processing, CEEC said. Dr Evans’ specialty is in understanding how ores respond in mineral processing circuits based on the behaviour of minerals in breakage, liberation and separation processes. In her current research, she is focused on applying her expertise in geometallurgical modelling. “Having trained in the UK and worked as a metallurgist for more than 30 years, including at mines in South America and Australia, Dr Evans brings a global and practical industry perspective to her research and teaching,” CEEC said. CEEC CEO, Alison Keogh, said: “The new team brings a wealth of experience and diverse skills and perspectives to enable further development of the energy curves in response to the needs of the mining industry. “Dr Evans is well versed in the dynamics of the energy curves and is leading the liberation and recovery enhancement as part of the A$469,000 ($334,264) CEEC Advanced Energy Curves project, a two-year partnership between the Queensland Government; METS Ignited, an Australian Government Industry Growth Centre; and CEEC International. Keogh said the aim of the energy curves was to help the mining industry improve the energy efficiency of its comminution circuits. She said CEEC had an extensive online library of case studies that demonstrated these improvements. “The energy curves also enable industry leaders to canvas the best improvement options for their particular operating environment and to compare alternatives,” she said. JKMRC is part of UQ’s Sustainable Mineral Institute (SMI) and employs some of the world’s leading comminution experts. 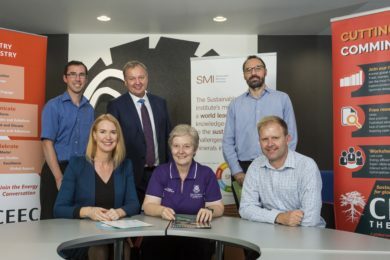 SMI Director Professor, Neville Plint, said: “Energy efficiency is one of the biggest issues facing the mining industry and we are delighted that this collaboration with industry will continue to develop under Dr Evans’ leadership. Keogh thanked Dr Ballantyne for his outstanding work in developing the foundation energy curves and leading the recent enhancements. “Dr Ballantyne was instrumental in the development of the foundation energy curves, managing and building the associated database, and leading interactive workshop sessions on the application of the curves. He also harnessed significant industry input and led six new enhancements, developing the energy curves to become a trusted, global benchmarking and improvement tool,” she said.